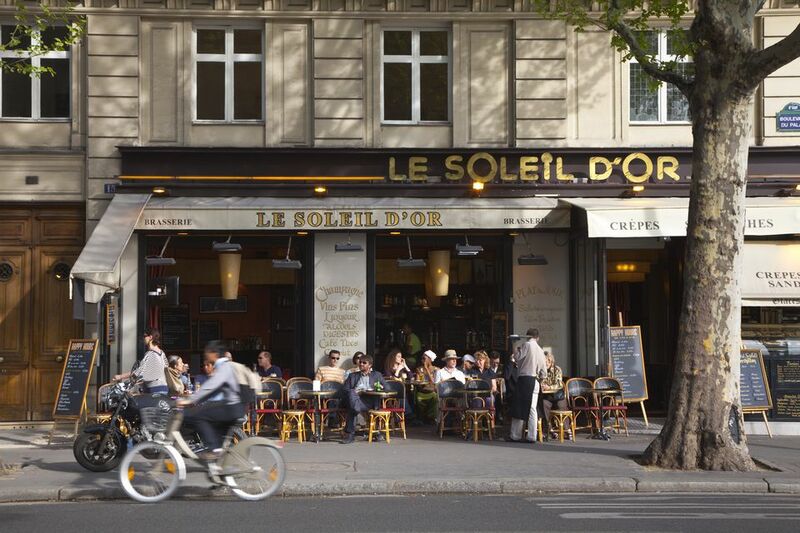 Sitting at the terrace of a sidewalk cafe in Paris and sipping on a Perrier, or drinking a glass of wine while watching passers-by is a pleasure many travelers promise themselves to experience. But then comes the check and the question that can be so fraught with difficulties: to tip or not to tip, and how much? Here are some simple rules to follow. Is the restaurant bill all-inclusive? Unlike in America, cafes and restaurants in Paris and the rest of France directly include a 15 percent service charge in your check. This is required by French law as tips are assessed for taxation purposes. The 15 percent service charge is clearly itemized on your check, on top of the TVA tax (a French version of the sales tax). The words service compris (tip included) indicate that the tip has already been included in the total to be paid so take a good look at the bill when it arrives. The good news is that prices rated on the menus are all-inclusive: they include both the 15 percent tip and the sales tax. There is no last-minute unholy surprise when you are given your check. What you saw on the menu is what you get charged for, no hidden extras. So no extra tips then? Well, a small extra tip is always appreciated, of course. It’s the mark that you were satisfied with the way you were served by your waiter (garçon in French, pronounced ‘Gar-son’ with the ‘on’ sounded like in ‘honking’ not like in ‘son’). It’s a sort of a ‘Thank You’ note. But remember that you are under no obligation here. Small extra tips are also appreciated because they go directly into your waiter’s pockets, unlike the 15 percent tip charge which is usually tallied up at the end of the day and divided among all the waiters. In some bars, the owner may even keep the totality or part of the tip charge and you will not know if that's the case. French law does not require that service charges be distributed to waiters. So your waiter might not even see a dime of it. But once again, remember that you paid your dues when paying your check, and you are under no obligation to extra tip. How much should the extra tip be? Extra tips may range from just a few cents for a coffee or a soft drink, to 1 to 5 euros for a lunch or dinner. A nice and very generous "Thank You" is 5 to 10 percent of the total check though this is unusual. But once again, there is no obligation, and no steadfast rule as far as the percentage goes. How do you ask for the bill? Don't be shy about asking for the bill in French. It's 'l'addition, s'il vous plait'. What about tipping in other situations? A tip is a valuable extra income for their beneficiaries. Case in point: taxi drivers. The average driver employed by a cab company doesn't earn a large amount. This is for 10 hours of hard work per day. A few years ago, cab drivers used to work 14-15 hours a day, 6 days a week to pad up their wages. French law now forbids it. So tipping them 5-10 percent of your fare is generous. It is customary to tip the usherette at the Opera House. A couple of euros is fine (the usherettes also get paid on sales of evening programs). Give a euro to the ushers at the movies. There was a time, not so long ago, when usherettes at movie theaters were not paid at all by theater operators. They lived on tips only. This is no more the case today and they are on salary, but usually no more than the minimum wage. Two to three euros per bag to your hotel porter is the norm and a bit more if they are very pleasant and helpful. In some expensive restaurants, at classical concerts halls or at discos, ladies in the lobby usually take care of your coats. It is customary to tip one euro for every large item when you come back to pick up your belongings. If you take a guided tour at the museum, you might leave a couple of euros to your guide to thank him for imparting his knowledge to you. If you're on a coach tour and the guide has been good, five euros will bring a smile. These are guidelines based on custom and experience. Yet they are not strictly followed in France. This advice applies in Paris as well in other parts of France, where your tips will be considered a mark of generosity on your part as the standards of living there are not as high as in Paris. This is what tipping really is: a demonstration of generosity, and a way to express satisfaction for the service you were just provided. Americans have a reputation of tipping well, so just add a few cents or euros and you'll get a smile at your generosity.